So what is mao cha? Mao cha is a simple county-style manufacture of leaf materials that consists of simply pan-firing the fresh leaf, rolling the leaf and allowing it to dry slowly in the sun. Mao cha is drunk by villagers in Yunnan ( it is essentially young sheng Pu-erh) and it is the base tea for all forms of Pu-erh. Mao cha is simple to manufacture but is complex in its diversity. Mao cha can be made from the fresh leaf of one tea garden or be a blend of leaf from an entire tea village or from several tea producing villages within one county. The beautiful, distinctive appearance of these russet colored shou Pu-erh buds is the first clue that this tea is something special. This tea is comprised entirely of large, elegant golden buds which are carefully fermented in cloth bags rather than being heaped in the usual large, layered piles in the fermenting troughs as is customary in shou Pu-erh manufacture. By treating the tea in this careful manner, the buds retain their length, fullness, and distinctive shape. Additionally, this tea is also more highly fermented than most shou Pu-erh (for more than 70 days rather than the traditional 45 days), which develops a deep golden caramel color and a bronze-red-amber liquor in the cup.This tea has none of the usual heavy-handed shou Pu-erh wo dui pungent flavor – it is full of earthy, rich and honey-ed aromatics and a super-smooth, pleasantly earthy flavor. 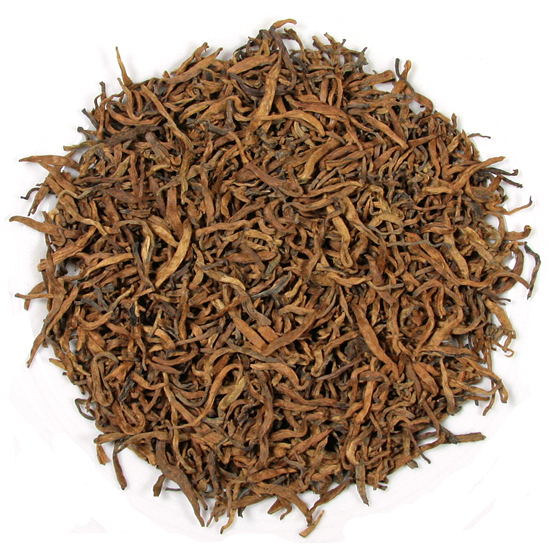 This well-made Pu-erh is an incredible treat for the Pu-erh enthusiast. It is elegant in appearance (which one does not say about shou Pu-erh too often) and quite delicious and elegant in the cup, too. Having been aged for a full 4 years now, this Pu-erh is an unbelievable value and opportunity for the tea enthusiast.